I'll watch any movie with Godzilla in it. But for a Black Hole review, I have to consider if I can recommend it to you. Godzilla films can be very uneven - the monster action is always fun, but the plots can sometimes drag, or even be embarrassingly bad. From the last wave (1999-2004), I rewatched Godzilla x Mechagodzilla, while thinking of an audience who may be new to the franchise. After the stupendous Gamera trilogy of the late nineties, from rival studio Daiei, the annual Godzilla movie franchise had to modernise its approach. 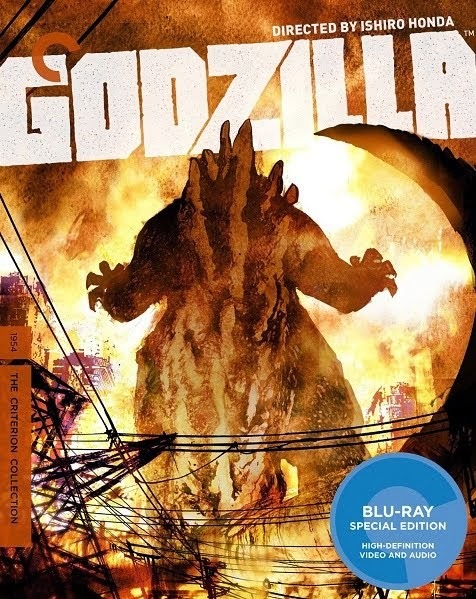 Godzilla Millennium relaunched the series (after the American Emmerich/Devlin remake of 1997), and these were all stand-alone stories, spinning off from the original premise. A grittier Godzilla emerged. He's back to being a problem of mass destruction, rather than a children's hero. Once more he’s threatening Tokyo and the Japanese government have to find a way to stop him. They remember that the original Godzilla skeleton still lies at the bottom of Tokyo Bay (where he was defeated in the very first film in 1954). Using a Jurassic Park ruse, scientists propose to use the skeleton as a framework, combined with the Godzilla DNA in the bones, to create a duplicate monster. Enhanced with a robot exoskeleton and under military control, it should defeat the oncoming threat. 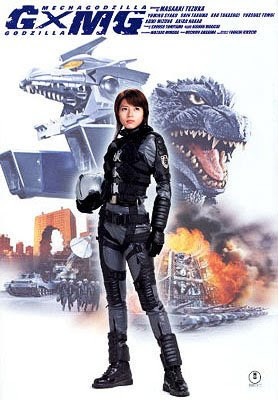 Chosen to operate Mechagodzilla's controls, is a young pilot, (Yumiko Shaku, the star of Princess Blade and Sky High), who isn't trusted by her team-mates after a disastrous incident while trying to kill Godzilla using maser cannons, several years earlier. Having a female action hero is a twist in Godzilla films. Add to this her tragic backstory and she has reason to look perpetually grumpy. The producers still can't resist adding a cute little girl and her klutzy father for extra pathos and comedy relief, but these are far less painful than they sound. The realism is greatly enhanced by the use of actual full-size tanks - toy tanks bouncing towards Godzilla are traditionally a funny, guilty pleasure in the series. But here the modelwork and explosions are bigger than ever, and they even use a little CGI, though the look of this has dated already, the suitmation less so. 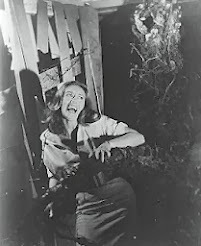 Men in monster suits wrestling, is the mainstay of the special effects. Albeit fantastically designed and constructed suits, surrounded by intricate and extensive cityscape models. But as the action scenes wear on, there's no actual build in the excitement or the story. Mechagodzilla has very few tricks up its sleeve after its first fight, and ends up repeating itself. For once it's launched by VTOL aircraft, rather than by the unlikely rocket jets in the soles of its feet. The movie is good, solid spectacle, above average for a G-movie, and the action kicks off early with a quick appearance of the big G right at the start. 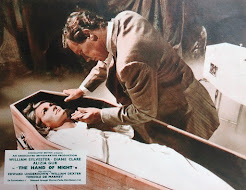 The plot is fairly old-fashioned, as are characters and the overall feel - you'd be forgiven for mistaking it for a film ten years earlier. The Maser cannon weapons are a welcome blast from the past, and there are some surprising flashbacks to lesser-known monster attacks from classic Toho films. 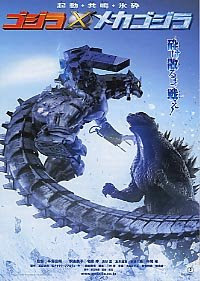 This is a good example to showcase the latest generation of G-films, while we wait for Godzilla to endure his eight-year hiatus, self-imposed by Toho Studios after Godzilla: Final Wars in 2004. 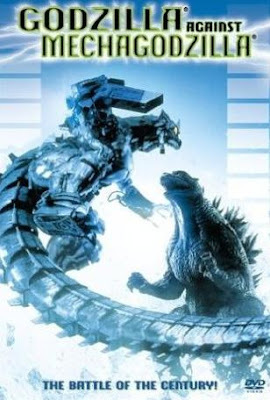 Columbia Tristar released a good DVD of Godzilla Against Mechagodzilla in the US, correctly aspected in 2.35 anamorphic, with English or Japanese language options.